Again we can add a new camera to our database. This time it is Nikon who is introducing a new easy-to-use digital camera with a 4 effective Megapixels resolution and a handful of useful functions. The Coolpix 4200 features a newly developed 3x optical Nikkor zoom lens with a focal range of 7.8 to 23.4mm (equivalent to 38-114mm lens in 35mm format). This new lens is featuring aspherical elements and an ED glass element which is usually only seen in high-end models. This ED element helps to reduce aberration, but is also helping to reduce the dimensions of the body. The Coolpix 4200 is equipped with a CCD offering 4 effective Megapixels which will ensure rich detailed recorded images. The aluminum exterior of the Coolpix 4200 is stylish shaped and features the same handy grip-design as the other cameras in Nikon's Coolpix range. The compact dimensions and light weight makes a good combination of comfort in the hand. Furthermore, all controls are conveniently located within easy reach on the back of the camera body. This will enable a straightforward control of the camera and with the built-in 15 Scene modes photography is as easy as pushing only one button. Each of these modes adds simplicity for the shooting of a different kind of subject, while four of them offer a Scene Assist function. A new feature to the Coolpix range is an advanced red-eye reduction mode that is fully integrated into the Nikon image processing system within the camera and once enabled operates without the need for any user intervention. The very fast power-up, continuous shooting mode and precise Auto focus helps the user to catch their favourite moment at any time. White balance offers a choice of Automatic, Preset and 7 Manual modes. What’s more, it divides the shooting area into segments to determine the most appropriate setting for the capture of faithful colours. There's even a white balance bracketing function too, which takes a series of three shots at different white balance settings with just a single press of the shutter release button. Beside recording still images the Coolpix 4200 can record movies of TV-size quality at a rate of 15 frames per second. Both images and movies are recorded on a Secure Digital card or on the internal memory of 12MB. Due to the fact that the new Coolpix member offers great specifications high quality prints up to A4 format are ensured. Printing can also be done without the need for a PC because of the compatibility of PictBridge support. The Coolpix 4200 offers versatility in terms of power source, with compatibility with both Li-ion rechargeable batteries and lithium disposable batteries also. All recorded movies and images can be automatically imported into the included Nikon PictureProject software (introduced 14 days ago), which opens up a whole new range of possibilities for the digital photographer. Enabling organization, editing, and design capabilities for images in a unified, user-friendly interface, this exciting new software from Nikon will also allow the addition of new features as the market evolves. 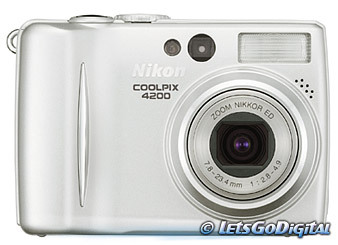 Nikon will launch the Coolpix 4200 worldwide from June 2004.